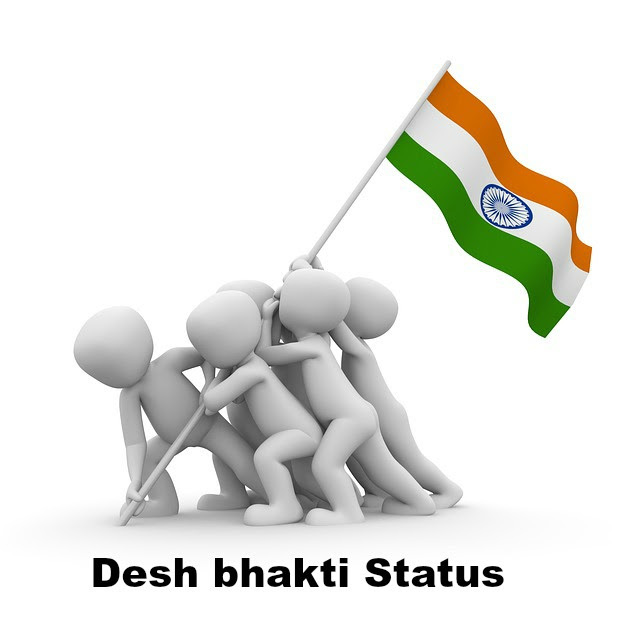 Enjoy Desh bhakti status in Hindi for Whatsapp, independence day, republic day. Get short, cute, hot, funny, patriotic Desh bhakti status for Whatsapp, facebook. Enjoy only new, unique and updated Desh bhakti status, quotes, sayings or messages. If you are desh bhakt and want to show Desh bhakti for your country then enjoy our short and inspiring Desh bhakti status in Hindi for Whatsapp. Just share and feel proud of your country and their men. Can Read: Best emotional status for Whatsapp. कौन कहता है लोग अमर नहीं होते, सैनिकों की देश भक्ति किसी अमरता से काम है? Can Read: Best of Motivational or inspirational status for Whatsapp, Facebook. In case, you want Hindi Desh bhakti status and that too written in English. Keeping your points in mind we have written short bhakti status for Whatsapp. Just enjoy and share these inspirational quotes. Desh bhakt sipahi ko nasha desh ki aan baan aur shaan ka hota hai, nashe mein wo jaan le bhi sakta hai de bhi sakta hai. Aaj phir desh ki dharti par hamare apno ka khun baha hai, chalo aaj dushmano ki int se int baja den. Ishq mehboob se karo ya mehbooba se karo, par jaan apni un par jaya na karo, Agar ho desh bhakt to bas thora chaukanna raha karo. apne pyar pe to marta hai har koi, apne watan pe marta hai koi koi. Garv hai ki mai apni maa ka laal hun, waqt para to ye laal dharti maa ke liye dushmano ko laal kar dega. Hindustan jindabad tha aur rahega, jise shaq hai uske janaje par jindabad ke naare lagayenge hum sabhi. Desh bhakti desh mein reh ke hi nahi dikhayi jaati, pardesh mein naam karna bhi desh bhakti hai. Watan se dur hai to kya, 1000 logon ke samne keh sakta hun, mujhme desh bhakti aaj bhi jinda hai. Apne pyar ke liye maroge to aam hoge, watan ke liye maroge to kuch khaas hoge. Chahe sher ki tarah laro ya geedar ki tarah, marenge tumhe hum kutton ki tarah. Can Read: Best Life status for Whatsapp, Facebook. We have just covered best of the Desh bhakti status for Whatsapp in Hindi. If you are a patriot then live for your country pride and share it with your friends on social sites. If you really liked our content on Desh bhakti status for Whatsapp, then tweet for us or like us on facebook. It will motivate our team to add value to Hindi status for Whatsapp.